Welcome Sew Mama Sew readers! I assume you’re all here because you like winning free stuff, if you don’t know what I’m talking about, read more here. I started this blog as a place to show off the cross stitches I was making. Over time I’ve started doing a lot more besides just cross stitching. Two years ago I started doing English paper piecing and I was instantly hooked. It had the portability I loved about cross stitch and embroidery, but was quilting. I had a sewing machine but I rarely used it, so EPP was perfect for me. In May of this year I got a new Janome Magnolia 7360 and I’ve been constantly working on building my sewing skills and I am feeling like I’ve done enough that I can actually call myself a quilter now. Every month on 2015 I tried out a new skill as part of Try Something New Every Month. I just finished up my last one for December which you can read about here. Make sure you stop by to find out what Stephanie from Swoodson Says and I have in store for 2016. The first Friday of every month is Free Pattern Friday where I post a free cross stitch or embroidery pattern. I also sell cross stitch patterns in my Etsy shop. I’ve got a lot of new things in store for 2016 and I’d love for you to stick around and read more! I’ll be starting a newsletter in the new year and sending out a free pattern, so make sure you sign up for that! You can also follow me on Bloglovin. And you can always get a peek at what I’m working on over at Instagram! For Issue 8 of One Thimble I made my first English Paper Piecing pattern. This is a great simple pattern to get started with EPP and create something small that won’t take too long. I’ll be giving away three copies of this pattern, just enter below with Rafflecopter. Good luck! Love EPP and the pattern is adorable! I have never tried epp. I love EPP! I’m pretty new to it still, but it’s so much fun! I have never tried it but i want to! I have, it’s a love grrrr relationship. I have tried, first one wasn’t very good. Definitely need to try again! Just need the confidence to get started… Thanks for the giveaway! I’ve done EPP for about 20 years, first traditional ones and now more modern applications. It’s such a great technique to teach beginners! Not yet – but I’d love to try it! I have never tried EPP but I’ve always wanted to. Your pattern is adorable. 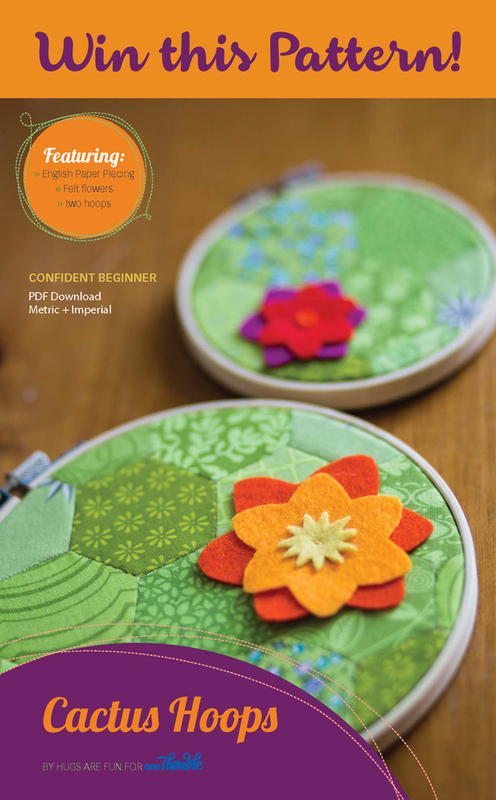 I’ve never been brave enough to try EPP, although I’ve saved more than a few patterns. I do love the looks of your cactus hoops pattern too. Yes, I have tried EPP, and I have a love/ hate relationship with it. I love how they look but it sometimes drives me crazy how long it takes to complete. Yes and I love it. Great portable project. EPP is on my list of things to try, but I have not done it yet!! Thanks for the giveaway. I’ve started an EPP piece but of course haven’t finished it yet. I do love it though. Have not done it yet, but trying a lot of new things this year. Yes, many years ago but I have been wanting to try again. I love that kind of sewing. I have tried EPP. I’m not that good at it. Need to practice more! I haven’t yet tried EPP, but it is on the roster for one of my hand-sewn sampler blocks that I’m working on =) Thanks! I have tried it and I’m hooked on making hexies! I love EPP – your little hoop is really cute! Yes, always thought I’d hate it, as I’m not too big on handsewing, but ever since I tried it, I really like doing it as it’s so relaxing and you can literally take it everywhere with you. Thanks for the chance to win! Love EPP!!!!! Am working on my third hexie quilt and am branching out to other shapes:) SO much fun!!! I haven’t tried paper piecing yet, but I’ve been watching tutorials and I can see how I might get really into it. I have done EPP, mostly hexagons. I have NOT tried EPP and I don’t see trying it any time soon! Love paper piecing – so much fun! I haven’t tried it in a while but have a hexagon UFO somewhere. Maybe this will inspire me to get it out. I have never tried, but that pattern in darling! I just started doing epp! I am hooked. Only hexies so far though. While I have never done cross stitch myself, I absolutely love it. Maybe someday!! I’ve never tried EPP, but I would love to try it! Never tried EPP, but I love doing hand work, so would like to try it. I have been wanting to learn EPP! I haven’t tried it but I keep thinking I should. Yes I have made a Grandmothers Flower Garden quilt and really enjoyed all the handsewing. Now I have to quilt the quilt top and I think I will hand quilt it. Thanks for the great giveaway. I’d like to give EPP a try . . . I enjoy handsewing. Thanks for sponsoring this giveaway! I haven’t tried it yet but I would love to. I love your challenge to try something different every month, I might do that for 2016 and paper piecing will be first on the list! no, I’ve never tried it. Sad to say I have no clue what paper piecing is so no I have not tried it before. But thank for entering the giveaway. I have really enjoyed visiting your blog and am following you now. I feel like I am a winner just by being introduced to this lovely site. I have never tried EPP, but it is on my list. No, but it’s on my list of new skills to acquire. EPP No, I gotta try both. Hooked on making small wallets like you . No, but I would like to try. I love learning new things. I have tried pep but haven’t made anything out of the hexies. I’ve made some hexies, they are so cute but I haven’t had much time to sit still and do anything with them 🙂 Love this giveaway! I haven’t, but the little intricate patterns are so tempting! I have not yet tried paper piecing but I plan on it soon! Yes and I love it! I love to EPP Hexis – they’re my roadtrip craft of choice ! Yes but it was at a time that I was rushed and under pressure from other things. I learned that you have to be patient and have the time set aside for it if you want success. I tried it years ago and enjoyed it. I’d like to pick it up again. Yes, I love English paper piecing! Thanks for the chance to win. This is a really cute pattern! I am too! I just finished piecing the Death Star and bought the background fabric today! No. I haven’t tried paper piecing yet. I have never tried English paper piecing, but I would love to learn the technique. Thanks for the great giveaway! Yes but I haven’t done it very much. I have never tried paper piecing, looks hard, but willing to learn. I love epp! Very cute pattern. I have never tried enlish paper piecing. I have never tried it but it sounds like fun.